A Second Stint in Scarborough! 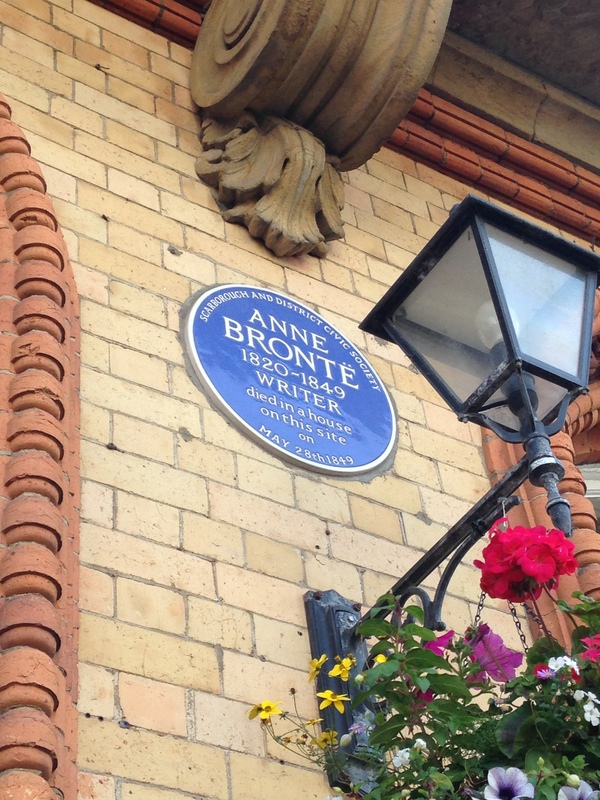 Having enjoyed the fantastic seaside town so much on our last visit, we were delighted to be asked back to Scarborough by cozy bookshop Wardle & Jones on Bar Street on 5th September – this time to talk specifically about Anne Brontë, the youngest in the family, and the only one to be buried separately from her family. 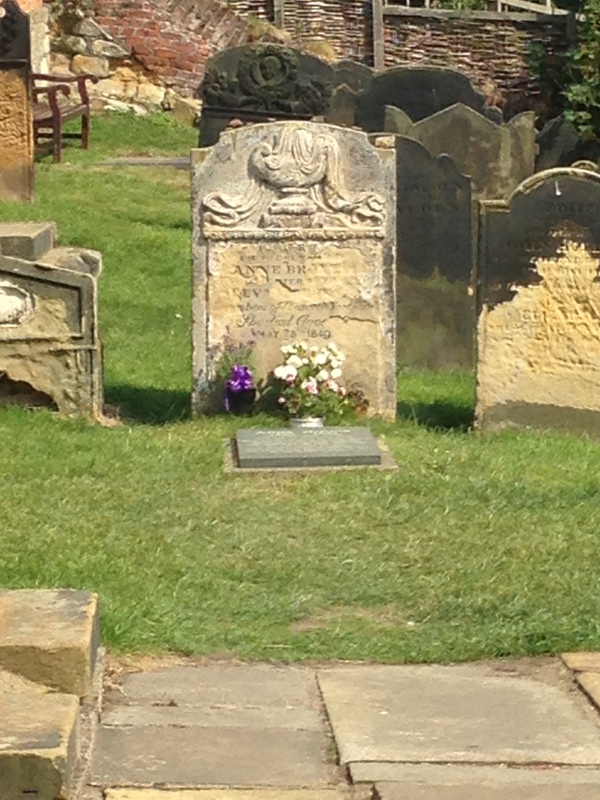 Her father Patrick and mother Maria, along with her siblings Maria, Elizabeth, Charlotte, Branwell and Emily, were all laid to rest in the Brontë crypt under St. Michael’s church in Haworth. 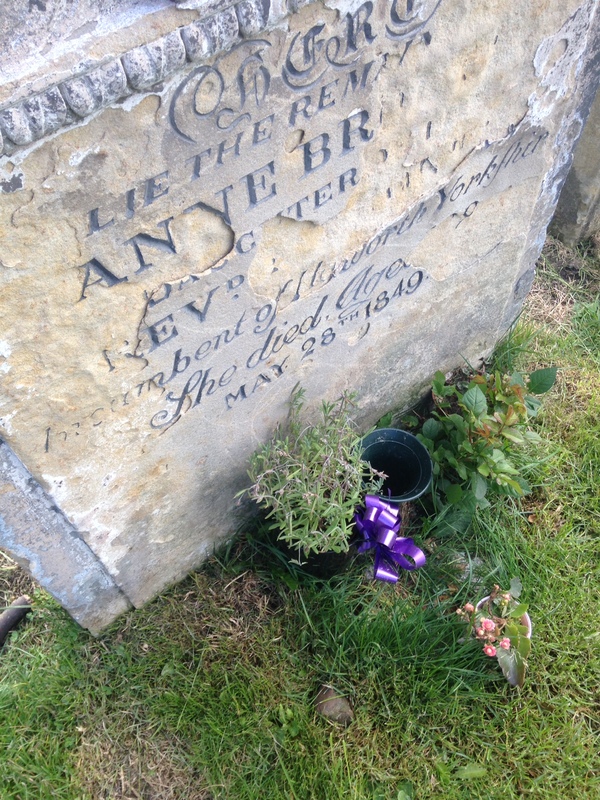 Last time we were there, we placed a little pot of lavender next to her grave, and it was lovely to see that, while not so vividly coloured any more, it was still there! 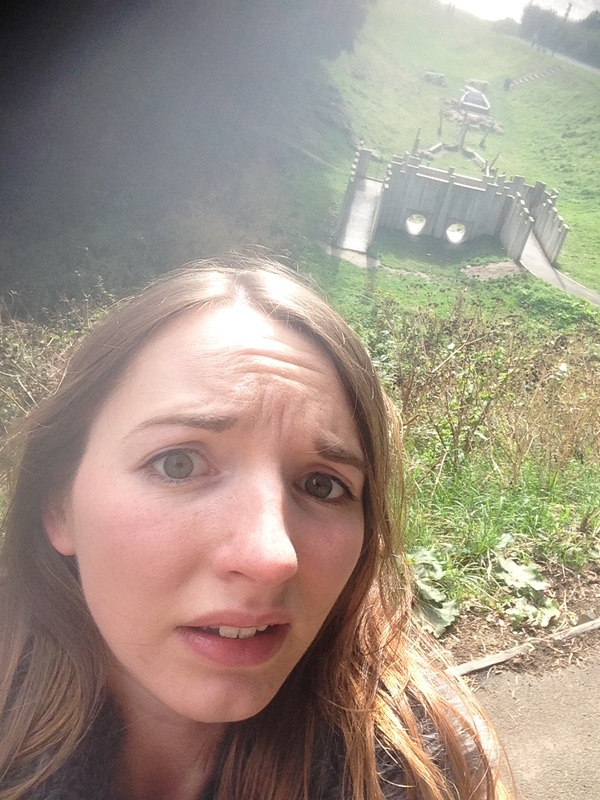 I thought I’d take a wander up and round the castle walls – something I’d failed to do on the previous visit. It was utterly fantastic, and, while the day was a little cold (there were still proper Yorkshire people swimming in the sea, mind!) the views were still superb. On my way, I came across a play area that made me question whether or not I cared what people would think about a grown woman playing on wooden battlements. 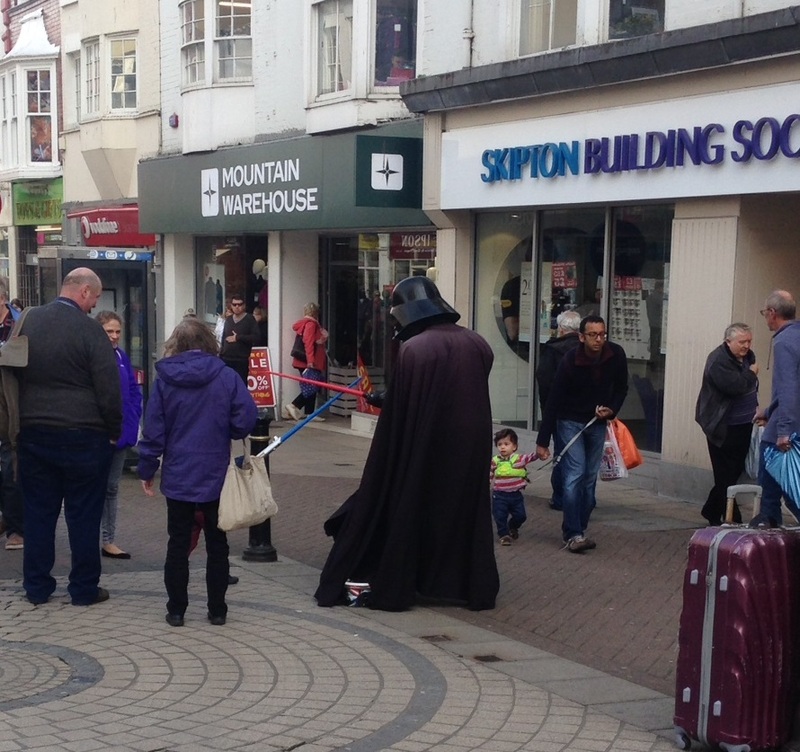 And on returning to the town, I came across Darth Vader, who was busy challenging children to lightsabre battles. Pick on someone your own size, Vader! I had a fantastic time at Wardle & Jones, particularly because at least one member of the audience went on to buy a copy of The Tenant of Wildfell Hall from the shop immediately after the reading! I was made to feel really at home, and very much enjoyed one of their glorious brownies (seriously, you need to try those things!) I’ll definitely be visiting them again when I’m back in Scarborough on 1st October, when I’ll be taking the readings to the local library! Yesterday, we found ourselves in the territory of the prestigious “Lake Poets”. In this day, when there is not a writing poet worth sixpence, the field must be open, if a better man can step forward. According to contemporary accounts, Wordsworth was less than impressed by Branwell’s writing-off of every one of his contemporaries – the majority of whom he respected highly – whilst seemingly naming himself as his addressee’s successor in one sentence. The letter remained unanswered. Literature cannot be the business of a woman’s life, and it ought not to be. The more she is engaged in her proper duties, the less leisure will she have for it even as an accomplishment and a recreation. Three years later, Branwell found himself relatively nearby in Broughton-in-Furness as the tutor to two young boys who were part of the Postlethwaite family. On days off, he often took excursions around that area of the Lake District and, in Ambleside, found himself in the company of Hartley Coleridge, son of the poet Samuel Taylor Coleridge. Small in stature and highly strung just like Branwell himself, Coleridge was an opium addict and prone to poor health. His conditions seem now to be an eerie forewarning of the later decline of his young friend. The two got on extremely well, to the point where Branwell decided to show Coleridge translations from the Odes of Horace that he had been working on. As far as biographers have been able to discern, Coleridge was extremely impressed, and the pair seem to have started hatching a plan for the publication of the works. A draft of a hugely enthusiastic letter from Branwell to Coleridge is still in existence, in which he promises to complete the remaining translations and that, if Coleridge was able to assist in the publication of the work, he would happily split the profits with him. 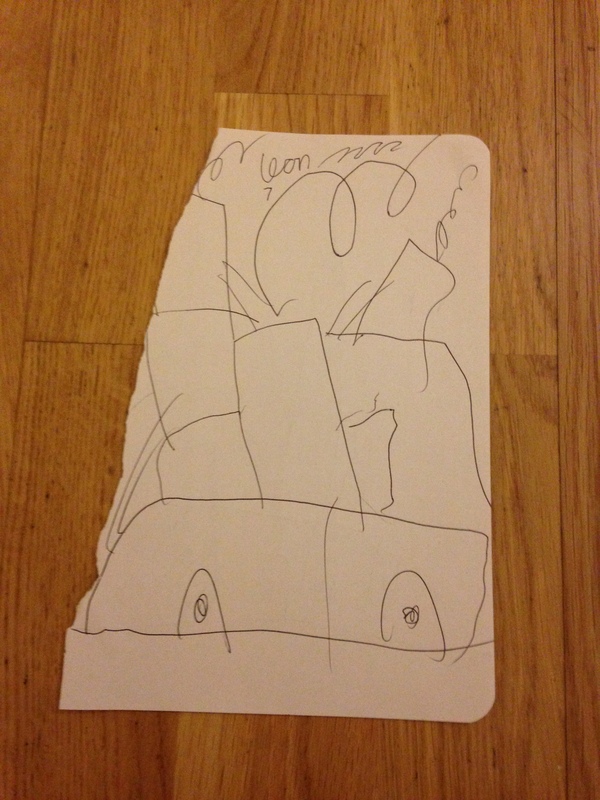 The letter was almost certainly sent, but seems to have remained unanswered. Coleridge’s health, both physical and mental, was poor, and he may have been struck with a bout of depression that wiped all thoughts of his young friend from his mind. The 23-year-old Branwell’s correspondence with Hartley Coleridge was the closest he ever came to literary success. So much for the Brontës’ relationship with the “Lake Poets”. A further link with Ambleside arose ten years later, when the local papers announced that “Miss Brontë”, authoress of Jane Eyre, would be visiting “Miss Martineau” in the town. The pair mentioned, of course, were Charlotte Brontë (now the only remaining sibling after the death of her youngest sister Anne the previous year) and Harriet Martineau, the social theorist and political writer. During her time in Ambleside, Charlotte was cursed with the presence of one Sir James Shuttleworth, who enjoyed lecturing her and another visitor – who happened to be the novellist Mrs Elizabeth Gaskell – about the finer points of writing. The two women escaped into each others’ company and a friendship was formed that would last for the remainder of Brontë’s life. Gaskell was even approached by Charlotte’s father and husband, Patrick Brontë and Arthur Bell Nicholls, to write her biography after her death in 1855. 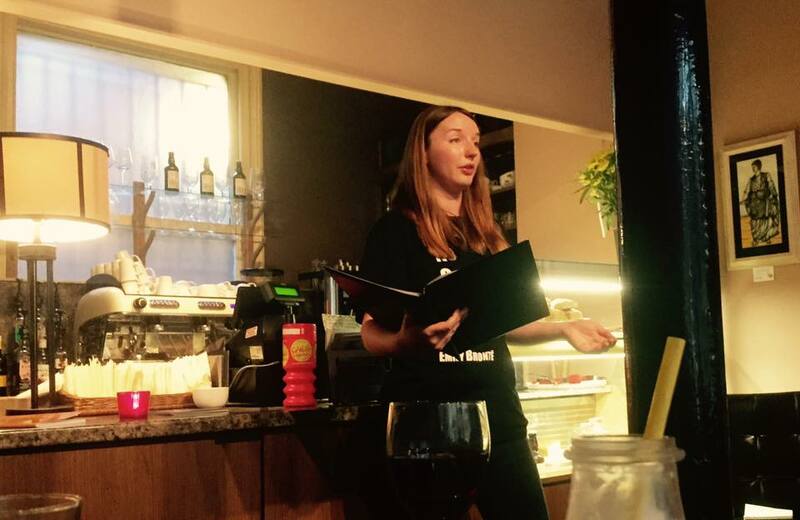 So, if you were in any doubt about attending one of our readings – there’s a reason why you should! 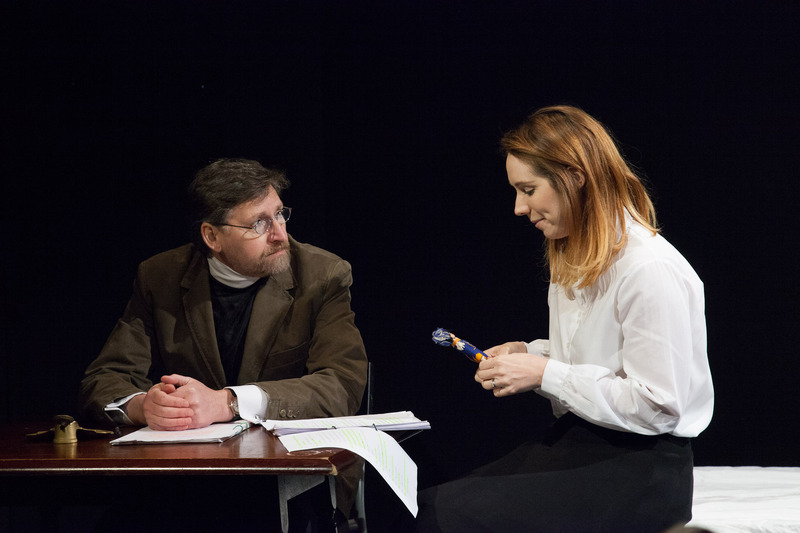 In case you missed us last time in Scarborough, we’ll be back on 5th September for a matinee reading at Wardle and Jones book shop at 2pm! This one’s slightly different. We’ll be exploring the life and work of the most underrated of the Brontë sisters, the accomplished social commentator Anne. Come along: the more the merrier! No need to book. A Fine Day in Scarborough! After a month with no readings, it seemed only right to get the ball rolling again with a trip to gloriously sunny Scarborough, a standout gem of Yorkshire where they do tea the proper way! 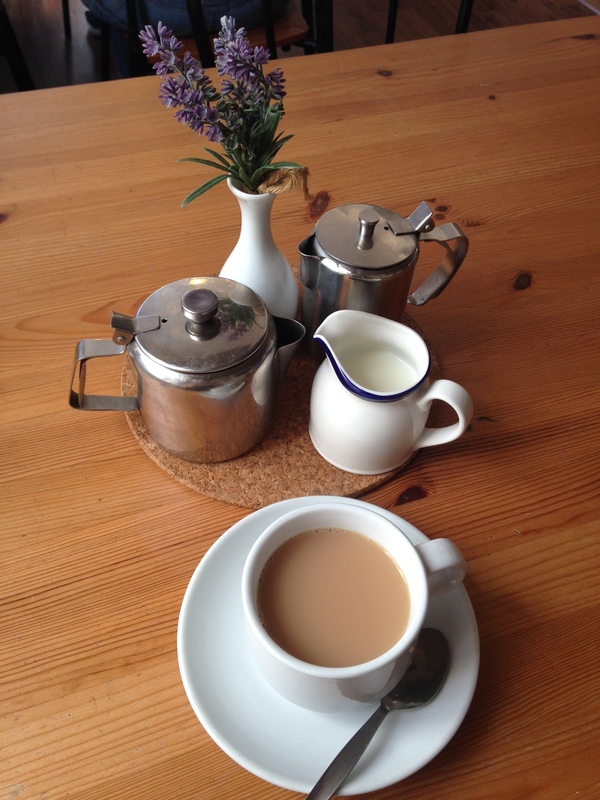 Tea from Cafe and Bistro on the Corner! Full English also recommended, especially after a long train journey! Of course, my joy at the appearance of actual real sunshine and the partaking of good strong tea was tempered by certain sober facts. Scarborough was the favourite holiday destination of the Robinson family, who employed first Anne Brontë, then Branwell too, as tutors for their children between 1840 and 1845, and took the two siblings with them on their trips, probably exposing them to more affluence than they had seen in their entire lives! It is very likely that the Robinsons made use of the highly fashionable Spa complex whilst visiting Scarborough, especially because of its strong connections to the world of music hall. Part of the Spa. Tres poshe. Branwell allegedly conducted an extra-marital affair with Lydia Robinson Sr, which was discovered just before he was due to join the family on a holiday, and his contract was terminated. Anne left the Robisons’ employment at around the same time – something that has never been fully explained but that many suggest was down to a powerful sense of shame. However, the seaside at Scarborough was always a very special place for her. 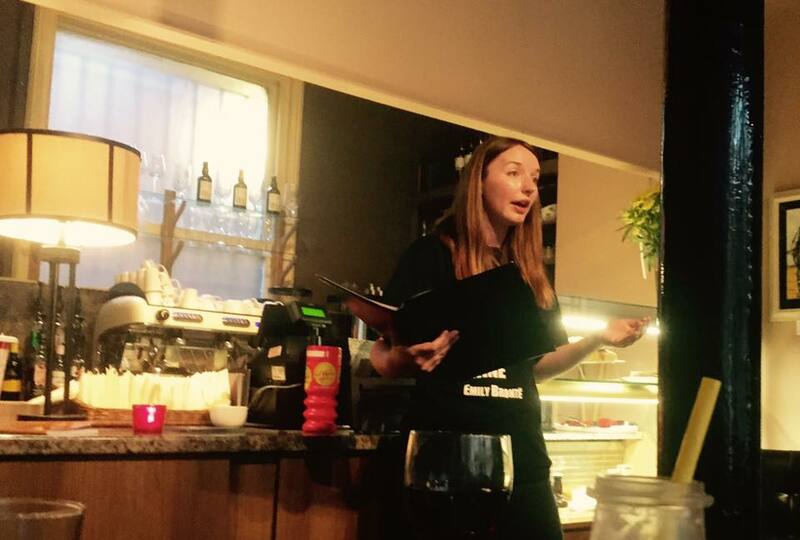 I arrived at Taylor’s Cafe and Books, a gorgeous independent venue on the beautiful hide-away Bar Street. 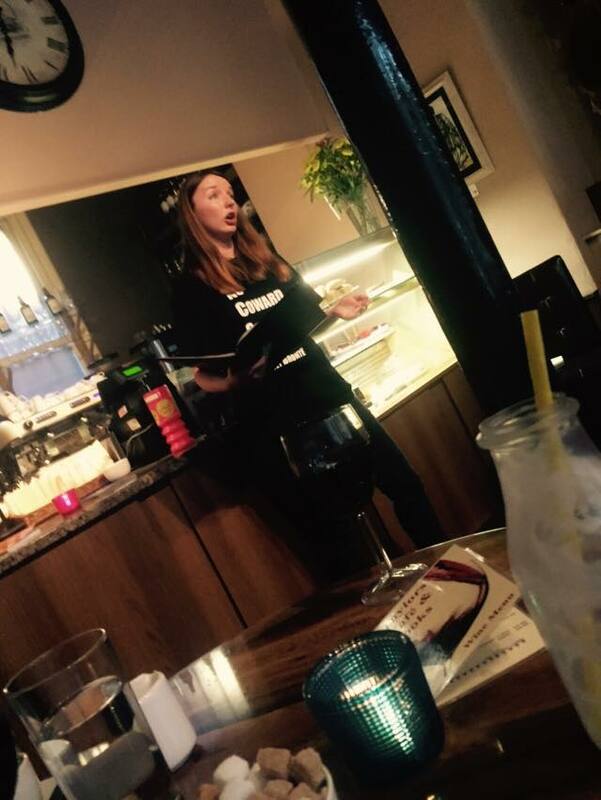 The readings went down brilliantly, but even more exciting were the lovely people I got the chance to meet. Among my friendly and receptive audience members was Julie Noble, an author of young adult fiction who wrote the astonishing Talli’s Secret – the story of a young girl suffering from dyslexia and dyspraxia with an inspired link to the Brontës. I am already two-thirds of the way through it and I cannot put it down! Please do read it if you get the chance, especially any parents with children that might be affected by these particular issues. 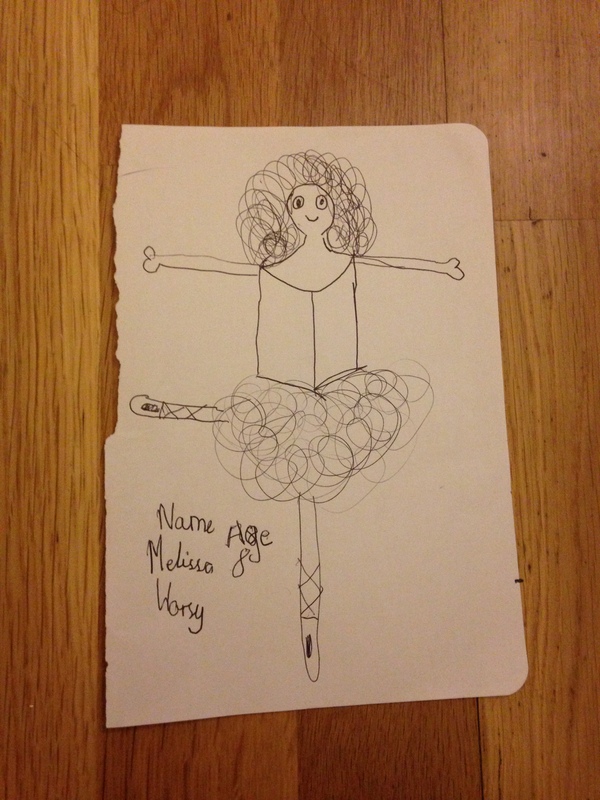 Meanwhile, skilled photographer Leon captured these images of me hard at work! Leon did a superb job, and I’m extremely pleased with the pictures. Here they are! 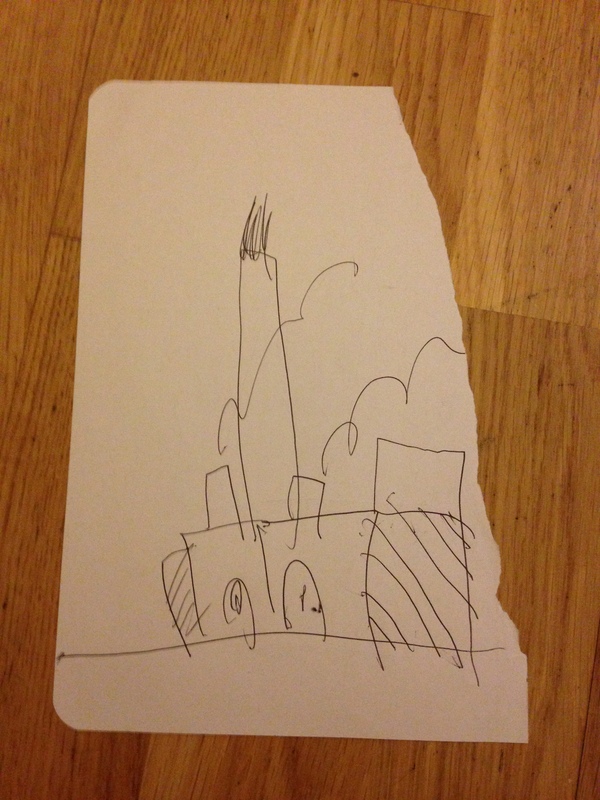 The first is a dramatic and very relevant image of a factory, smoke billowing from its chimney – just how the industrial buildings of Yorkshire might have looked in Victorian times. The second is a more domestic scene – a lovely house. It was wonderful to meet my lovely Scarborough group this evening, and the staff of Taylor’s Cafe and Books were helpful, enthusiastic and generally really lovely to be around. I’d strongly recommend a visit. Also, huge thanks to Wardle & Jones Books and Scarborough Library for their help in promoting the event! I’ll be at the Library on 1st October in anticipation of National Poetry Day, so get that in your diaries! 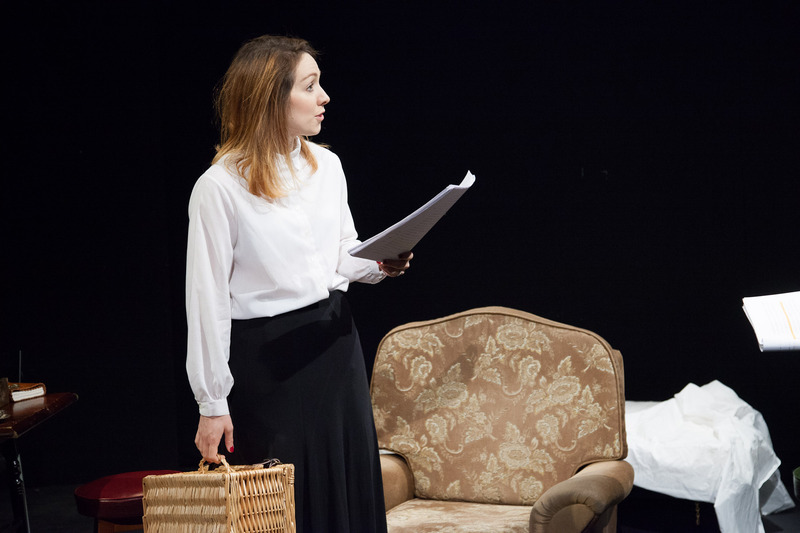 Also, keep you eyes peeled for more news about Dangerous To Know in Scarborough! 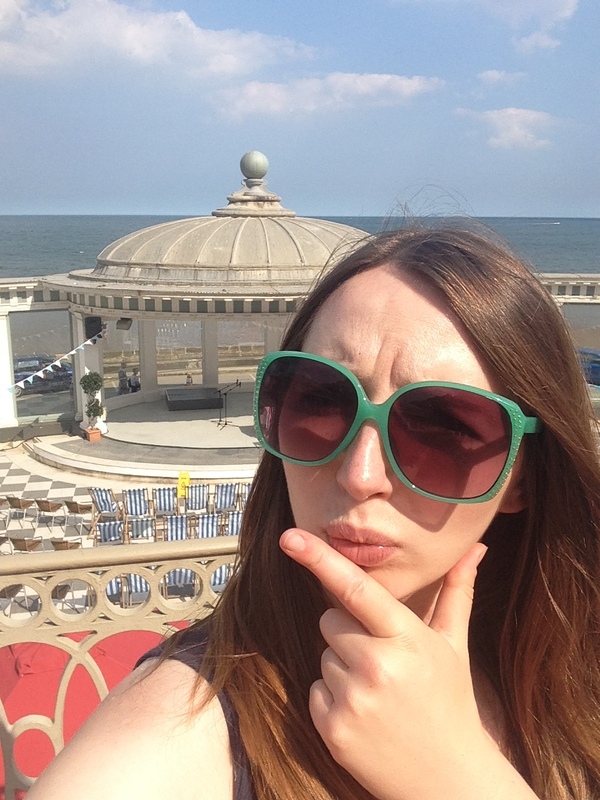 Not simply content with one reading in Scarborough (come along to Taylor’s Café and Books on 8th August at 6pm!) 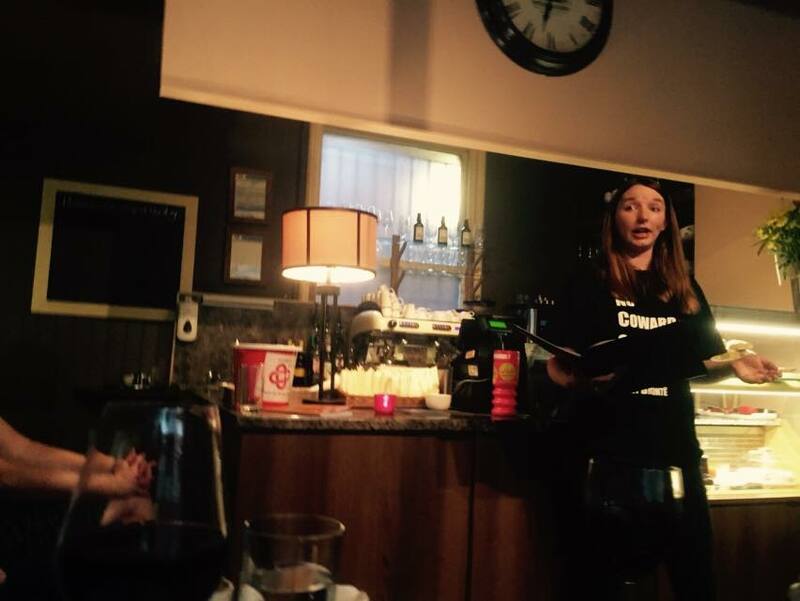 we have just confirmed a second event in anticipation of National Poetry Day! Caroline will be at Scarborough Library from 6pm on 1st October, reading a special selection of work by the Brontë family. The event will last for roughly an hour, and there will be refreshments available. 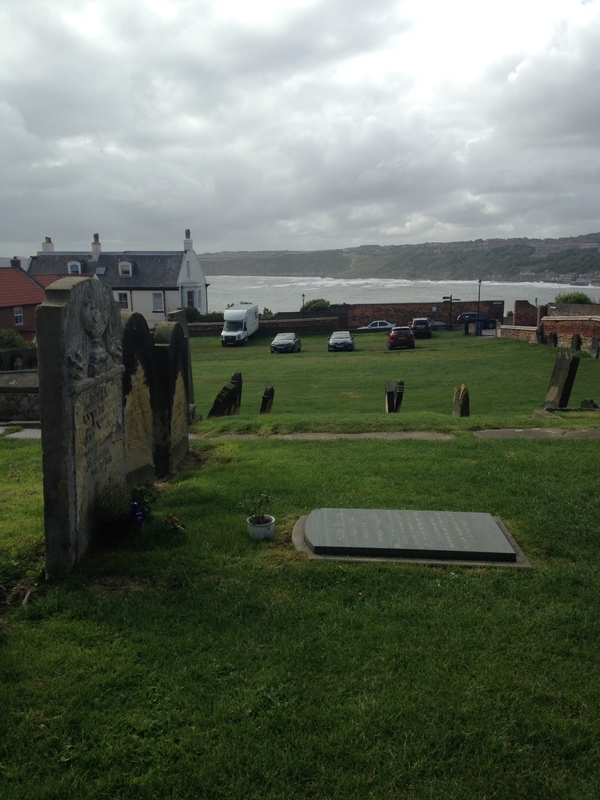 Scarborough is, of course, the resting place of Anne Brontë, the youngest member of the family, who died at the age of 29 in 1849. Her literary legacy is vastly underrated; Agnes Grey, her first novel, speaks out with understated sensitivity about the torturous trials and damage to self-respect suffered by governesses, and The Tenant of Wildfell Hall tackles readily the stigma attached to women who flee domestic abuse, and the moral dilemmas faced when raising a son or daughter in a society all too ready to dictate how it must be done. 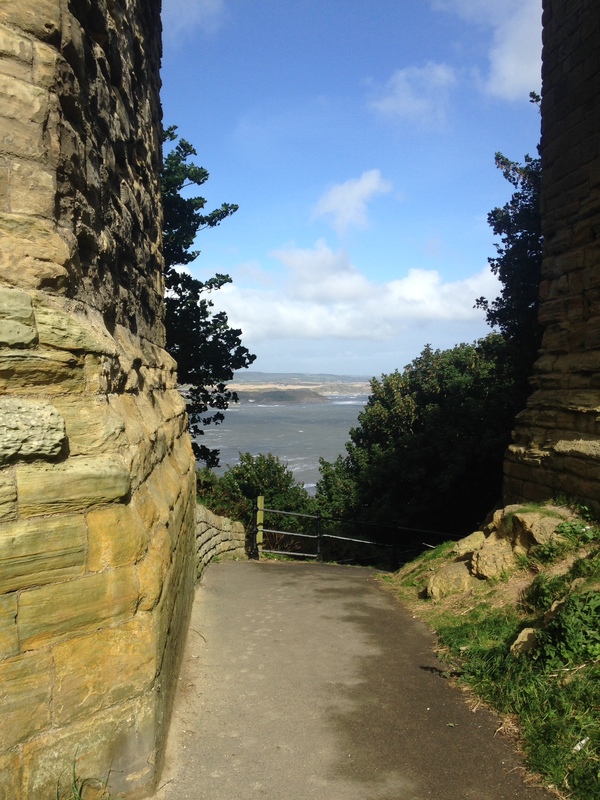 Anne, who worked as a governess with the Robinson family of Little Ouseburn near York for a lengthy period of her adult life, often accompanied her employers on their holidays to Scarborough. Her brother Branwell, who entered the Robinson’s employment a little later, would also join them. Branwell was later fired – strong evidence points to an affair with Mrs Robinson – and Anne left her position too, apparently out of shame. 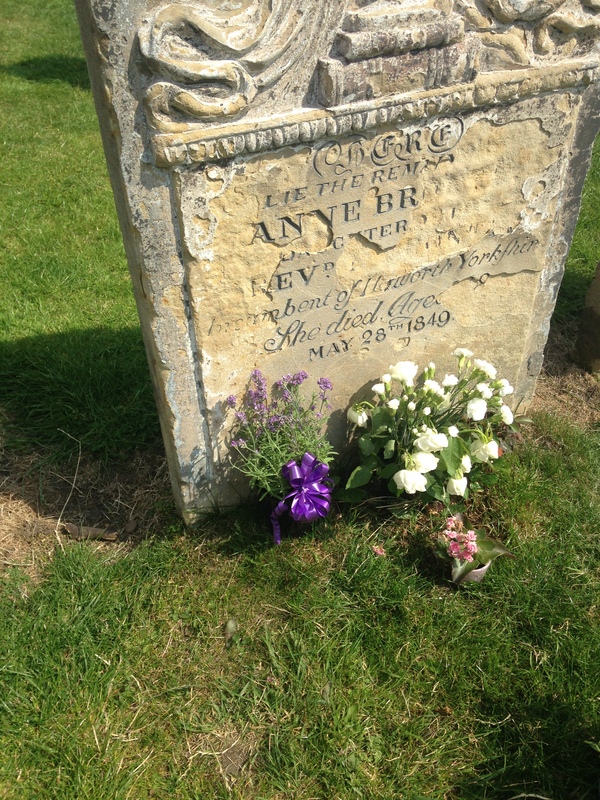 Anne’s pretty grave can still be visited today. 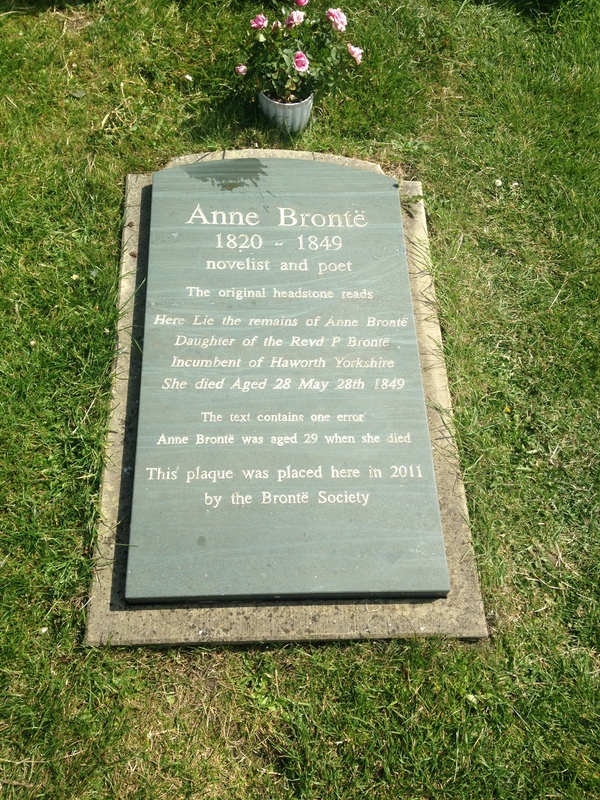 She is the only member of her family not to be buried in the Brontë crypt under Haworth church in West Yorkshire.